Nine’s miniseries Underbelly Files: Chopper is confirmed for the first 2 nights of the 2018 ratings season, – Sunday, February 11 and Monday, February 12. 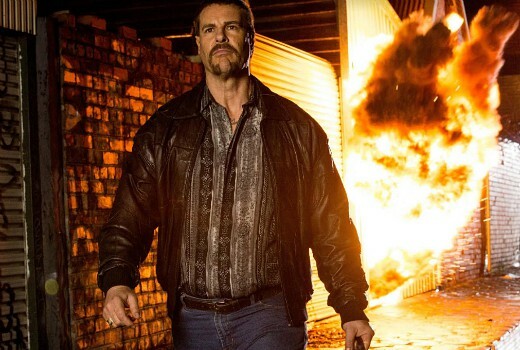 Aaron Jeffery portrays Mark “Chopper” Read in the 2 part miniseries, which includes incidents following the feature film starring Eric Bana. Vince Colosimo, Kevin Harrington and Debra Byrne also reprise former Underbelly roles. Starring award-winning actor Aaron Jeffery (Wentworth, McLeod’s Daughters, Water Rats) as Chopper, an outstanding cast will feature alongside him, including two-time Logie Award winner Michael Caton (The Castle, Packed to the Rafters) as Chopper’s father, Keith, Todd Lasance (The Vampire Diaries) as Chopper’s nemesis, the gangster Syd Collins, and Ella Scott Lynch (Love Child) who will portray his second wife, Margaret, with whom he shared a love that defied obstacles and lasted decades. The impressive cast also includes Zoë Ventoura as Chopper’s first wife, Mary Ann, Jane Allsop, Reef Ireland, Alex Tsitsopoulos and Anna Bamford, with original Underbelly alumni Vince Colosimo and Kevin Harrington returning as Alphonse Gangitano and Lewis Moran, and Debra Byrne reprising her portrayal of Judy Moran. Mark “Chopper” Read established a reputation of infamy by becoming one of the toughest criminals in Australian history. But in order to secure the affections of the woman he loves, Chopper fights to go straight. Yet the sins of his past, his ego and an ongoing feud with Syd Collins will make his hopes of a straight life a dangerous and near-impossible enterprise. Underbelly Files: Chopper explores the collision of Chopper’s two competing identities – the myth and the man. Underbelly Files: Chopper is a Screentime production in association with the Nine Network with production investment from Screen Australia and Film Victoria. 9pm Monday February 12 on Nine. Yes cause Seven and TEN are such good time keepers as well. Pity it starts late on Monday…will have to tape and watch later as I predict a finishing time of 11pm. Would have done well to be 4 x 1 hour episodes but clearly not a preferred way of screening on commercial networks. I’m looking forward to this. I didn’t realise it was only 2 parts, I assumed it was a series like the other Underbelly ones. The “Files” in the title indicates telemovie for this franchise.